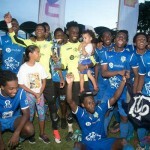 Defending Secondary Schools Football League (SSFL) Premier Division champions Presentation College (San Fernando) moved three points clear of the pack today, after edging Trinity College East (TCE) by a 1-nil margin in Trincity. 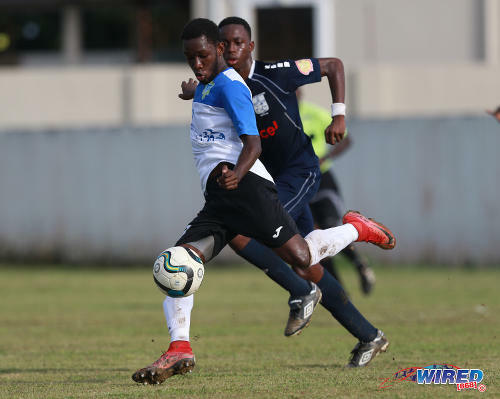 Presentation star player Jordan Riley got the solitary item, as he swept home a right sided cross from defender Juaval Roberts for a deserved winner in the 34th minute. Photo: Presentation College winger Jordan Riley (background) tries to slip around Trinity College East defender Stephan Hoyte during Premier Division action in Trincity on 24 October 2018. 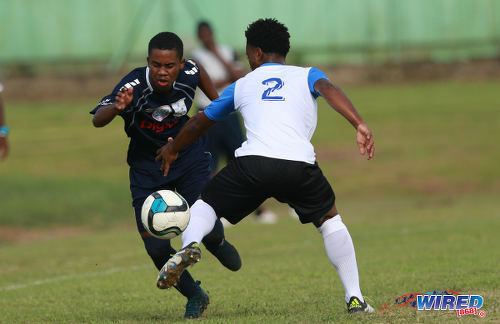 The win saw the “Pres Lions” stretch their lead atop the standings to three points, after second placed San Juan North Secondary suffered a heavy 4-1 defeat away to eastern rivals St Augustine Secondary. 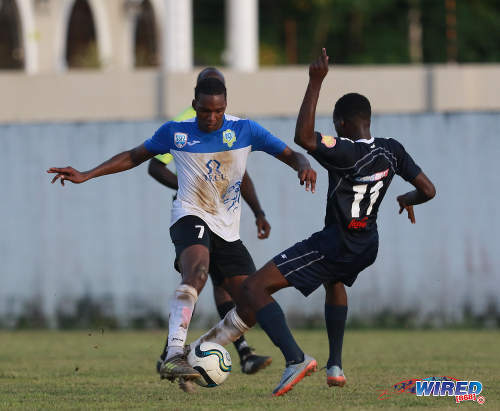 The Premier Division’s leading goal scorer, Kesean St Rose, did most of the damage with a double, which sank the boys from Bourg Mulatresse. 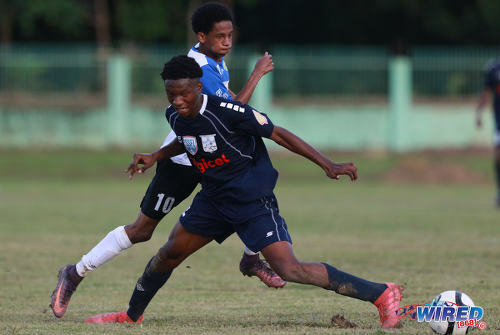 Presentation have 28 points, while San Juan North and two-time Premier Division champions Naparima College—who were on a bye today—follow with 25 and 22 points respectively. Meanwhile in Tobago, Bishop’s High School were relegated after a 1-1 draw with Valencia Secondary at the Plymouth Recreation Ground. Bishop’s, who are bottom of the 15-team table with two points, can only achieve a maximum of eight points now. But, even if they managed that, their goal difference of minus 20 would leave them needing to win their remaining two matches with a 10 goal aggregate, while still relying on results to go their way in other fixtures. It is unlikely to the point of being implausible. 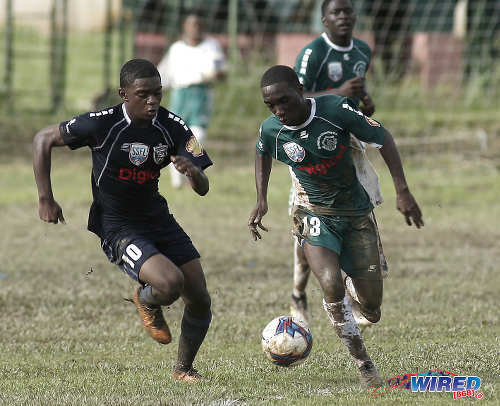 The other two relegation spots are occupied at present by St Mary’s College (five points) and Fatima College (seven points), who both lost today away to Carapichaima East Secondary and St Anthony’s College respectively. Photo: Valencia Secondary attacker Dwight Yorke (centre) takes on the Bishop’s High School defence during Premier Division action in Plymouth on 24 October 2018. 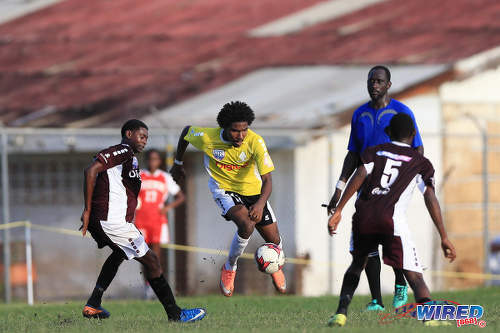 In Trincity, the situation was not nearly as bleak with hosts, Trinity East, comfortably in mid-table while Presentation chase their second league title in as many seasons. For the defending champions, the biggest obstacle was inspired “Trinity Blue Hawks” goalkeeper Kahlil Oliver, who made a number of impressive saves to deny the Pres Lions a potential tennis score. Though he declined to do a post-game interview with Wired868, Presentation coach Shawn Cooper would likely agree that his charges weren’t at their fluent best today. Still, with the hosts aiming long balls towards forward Jaden McKree and relying on the magic of tricky winger Tyrique Sutherland on the break, the defending champions were able to assert themselves on the contest, as they patiently looked for an opening. But that’s where they encountered Oliver. Time and again, the Pres Lions got through the Blue Hawks’ defence. But apart from Riley’s 34th minute item—which came after persistent play by attacker Omri Baird and lackadaisical Trinity defending—Oliver looked to have an answer for everything. 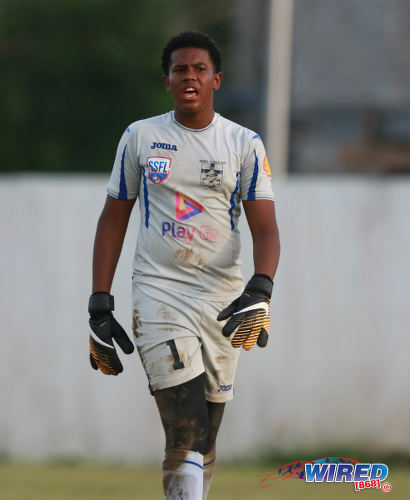 Photo: Trinity College East goalkeeper Khalil Oliver takes a breather during Premier Division action against Presentation College in Trincity on 24 October 2018. Oliver thwarted Riley in the eighth minute while he also did well to deny roaming Pres midfielder Ackeel “Hulk” Jacob from close range and keep out a rasping bullet from Aleem Barclay—all within the opening half hour. Still, Trinity might have ended the half on level terms as Presentation custodian and captain Jabari Gray was forced into a point blank save by opposing midfielder Christian Ransome. Grayson felt his team should have gotten more from that passage of play, after Ransome’s initial attempt to find a teammate on the counter was thwarted by an opponent. That chance apart, most of the fight from the hosts was quite literal, as referee Hasely Collette struggled to keep tempers in check. 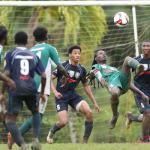 Photo: Presentation College utility player Darnell Hospedales (left) takes aim during Premier Division action against Trinity College East in Trincity on 24 October 2018. In the 38th minute, Sutherland and the stocky “Hulk” Jacob squared off after the visitors took exception to a hard tackle by Kerdell Sween on Hospedales. Just a few minutes later, Riley and TCE midfielder Isaiah Williams also sized up each other, after the Pres star player kicked out—following a tussle between the pair in the middle of the park. On both occasions, Collette kept his cards in his pocket. With the gifted pair of Kishon Hackshaw and Nickel Orr no longer in the ranks, Grayson—as promised—has turned Trinity into a defiant, workmanlike unit. Before today, their sole loss this season came against San Juan North. 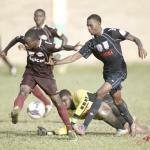 Photo: Trinity College East attacker Tyrique Sutherland (left) attempts to evade Presentation College defender Zion Allen during Premier Division action in Trincity on 24 October 2018. However, goal scoring remains a problem. Only Fatima College (nine goals) and St Mary’s College (eight goals) have scored less than Trinity’s 10 items this season, which contributed to the Hawks’ League-high five drawn matches. By the 88th minute, the Pres Lions had to make do with one less player, as defender Zion Allen was issued a second yellow card following a cynical foul during a Trinity breakaway. Allen’s indiscretion put his team under unnecessary pressure in the final moments; but the southerners held on. And as news of San Juan North’s defeat trickled through, there was a jubilant response from the defending champions. Cooper stopped the celebrations immediately. The Premier Division is not won yet. 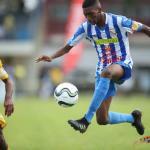 Photo: Presentation College forward Omri Baird (left) takes on Trinity College East midfielder Jarved Elcock during Premier Division action in Trincity on 24 October 2018. Photo: St Augustine Secondary forward Kesean St Rose (right) tries to outrun QRC left back Naeem Bisnath during SSFL action in St Augustine on 22 September 2018.